A high heel shoe puts your foot in a plantarflexed (foot pointed downward) position, placing an increased amount of pressure on your forefoot. This causes you to adjust the rest of your body to maintain your balance. The lower part of your body leans forward and to compensate for that, the upper part of your body must lean back to keep you balanced. This is not your body’s normal standing position. When walking, your foot is in a more fixed downward position (plantarflexed) therefore you are not able to push off the ground with as much force. This causes your hip flexor muscles in your legs to work harder to move and pull your body forward. Your knees also stay more bent (flexed) and forward, causing your knee muscles to work harder. Walking in high heel shoes is like walking on a balance beam. It takes a lot of balance and just like teetering on a beam, there is not any support in a high heel shoe to catch you if you fall. High heel shoes cause your foot and ankle to move in a supinated (turned outward) position. This position puts you at risk for losing your balance and spraining your ankles. The normal s-curve shape of the back acts as a shock absorber, reducing reduce stress on the vertebrae. Wearing high heels causes lumbar (low-back) spine flattening and a posterior (backward) displacement of the head and thoracic (mid-back) spine. High heel shoes cause you to lean forward and the body’s response to that is to decrease the forward curve of your lower back to help keep you in line. Poor alignment may lead to muscle overuse and back pain. The hip flexor muscles are located on the upper front part of your thighs. They are forced to work much harder and longer to help you walk because your feet are held in a downward position (plantarflexed) and have reduced power to move your body forward. If your hip flexor muscles are chronically overused, the muscles can shorten and a contracture can occur. If a contracture occurs, this could lead to flattening of the lumbar (low-back) spine. Knee osteoarthritis is twice as common in women. Some of that blame may be due to high heels. The knee stays flexed (bent) and the tibia (shin bone) turns inward (varus) when wearing high heels. This position puts a compressive force on the inside of the knee (medial), a common site of osteoarthritis. If you already have osteoarthritis, it is best to avoid wearing high heel shoes. High heels increase the distance from the floor to the knee and can result in increased knee torque which can also lead to osteoarthritis. High heels limit the motion and power of the ankle joint. The calf muscles (gastrocnemius & soleus) are shortened because of the heel height. The shortened muscles cause them to lose power when trying to push the foot off of the ground. The position of the ankle may also cause a shortening (contraction) of the achilles tendon. This can increase the pull of the achilles tendon where it attaches on the back of your heel bone (calcaneus) and may cause a condition called insertional achilles tendonitis. With the foot in a downward position, there is significant increase in the pressure on the bottom (plantar) of the forefoot. The pressure increases as the height of the shoe heel increases. Wearing a 3 1/4 inch heel increases the pressure on the bottom of the forefoot by 76%. The increased pressure may lead to pain or foot deformities such as hammer toes, bunions, bunionettes (tailor’s bunions) and neuromas. The downward foot position (plantarflexion) also causes the foot to be more supinated (turned to the outside). This change in foot position changes the line of pull of the achilles tendon and may cause a condition called Haglund’s deformity (pump bump). The narrow, pointed toe box that is often found in high heel shoes also causes damage such as corns, callouses and blisters. If you look at a baby or toddler’s foot you will see that their toes are spread apart. If you look at an adult’s foot, their toes are usually squished together. A lot of times this is due to the footwear that has been worn. If you trace the footbed (part of the shoe where you put your foot) of a high heel shoe on a sheet of paper, and then stand barefoot on that tracing, you will probably have quite a bit of overlap. Does it still seem like a good idea to put your foot inside that shoe? If your car tires are out of alignment, you can only drive so many miles before you are at risk of blowing a tire. The same is true for your body. Things need to be in alignment. It is recommended that you only wear high heels for special occasions and even then only a heel height of 1 1/2 inches. Your feet and body will thank you – and you’ll save money on trips to the podiatrist’s office. Coughlin MJ. The high cost of fashionable footwear. J Musculoskel Med. 1994;11:40-53. Ebbeling CJ, Hamill J, Crussemeyer JA. 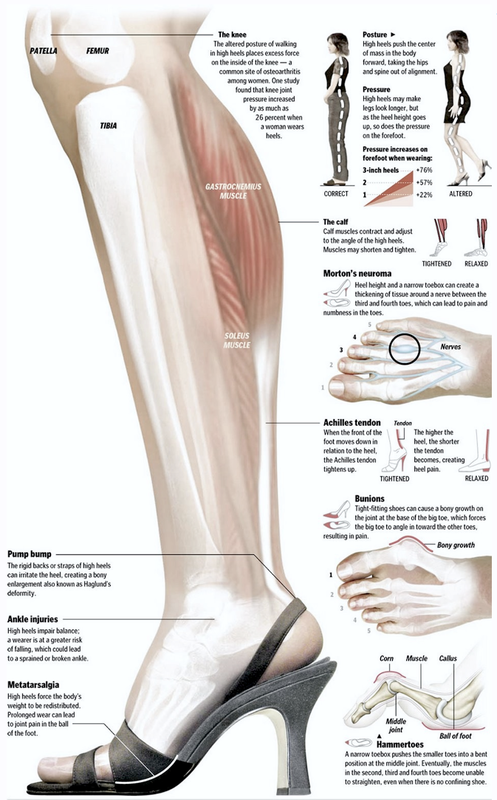 Lower extremity mechanics and energy cost of walking in high-heeled shoes. J Orthop Sports Phys Ther. 1994 Apr;19(4):190-6. Esenyel M, Walsh K, Walden JG, Gitter A. Kinetics of high-heeled gait. J Am Podiatr Med Assoc. 2003 Jan-Feb;93(1):27-32. Kerrigan DC, Johansson JL, Bryant MG, Boxer JA, Della Croce U, Riley PO. Moderate-heeled shoes and knee joint torques relevant to the development and progression of knee osteoarthritis. Arch Phys Med Rehabil. 2005 May;86(5):871-5. Kerrigan DC, Todd MK, Riley PO. Knee osteoarthritis and high-heeled shoes. Lancet. 1998 May 9;351(9113):1399-401. Opila KA, Wagner SS, Schiowitz S, Chen J. Postural alignment in barefoot and high-heeled stance.Spine. 1988 May;13(5):542-7. Snow RE, Williams KR. High heeled shoes: their effect on center of mass position, posture, three-dimensional kinematics, rearfoot motion, and ground reaction forces. Arch Phys Med Rehabil. 1994 May;75(5):568-76. How Bad is Restaurant Food For You? At-Home Version: The biggest problems with the restaurant slider are its fatty meat content and the refined-carbohydrate bun. So at home you can remedy these two issues. 1) Use lean, ground turkey to create petite patties. Use your grill pan to cook them with minimal oil, or outside on the grill. 2) Instead of the carbohydrate-filled bun, use large pieces of butter lettuce to wrap around your patties. Add sliced tomato, low fat cheese and grilled onion and secure the whole thing with a toothpick. These at-home sliders are guilt-free! Cooking more of your meals at home, using the tips above, will save you many hidden calories and goes hand-in-hand with regular, challenging workouts in seeing you to your fitness goal, Call or email today and I will schedule a time to meet with you one-on-one to strategize the quickest and most effective route to getting you to your fitness goals. In other words, your excessive snacking may be killing your fitness results. 1) Calories Count. Even when you’re snacking on “healthy” food, you’ve got to keep track of how many calories that you’re taking in. Almonds are healthy, but if you down 800 extra calories in them you’ll quickly gain weight. 2) Fill Up on Protein & Fat. A lot of well-meaning people are still afraid of fat. They think that if their snack is high in fat then it will end up on their body as fat. This is simply not true. Healthy fat, such as avocado or almonds, is a wonderful thing to snack on as it fills you up and keeps you full longer. 3) Avoid Sugar Calories. Sugar is an awful thing to snack on when weight loss is your goal. Refined sugar is a catalyst for fat storage, so avoid any snack that contains sugar. Remember that eating sugar will satiate your hunger for a very short period of time, and then you’ll quickly be hungry again. 4) Don’t Be Fooled By 100-Calorie Packs. A popular marketing technique is to package junk food into 100-calorie packs. These could be crackers, cookies, chips…basically any guilty snack food you could think of. The premise is that since you’re only eating 100 calories, the snack is healthy. I’m sorry, folks, but eating 100 calories of junk food is not a healthy snack. You are better off avoiding the junk completely and eating something wholesome. 5) Use The ‘Is It Real’ Test. As a rule of thumb, you should use the “Is it real?” test when deciding if a snack is worth eating. The test goes like this: If your snack can go bad, then it’s good for you. If your snack can’t go bad, then it’s bad for you. The idea is to eat fresh, real foods that are unprocessed and wholesome. These real foods are naturally filled with fiber, vitamins, and minerals and will assist you in achieving your fitness goals. This recipe makes a wonderfully healthy family meal. 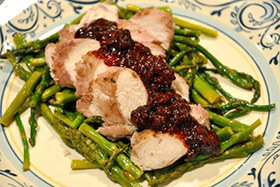 Use organic berries and chicken to get the most from your meal nutritionally and flavor-wise. Serve your chicken on a bed of steamed veggies or on a dark leafy green salad. Rinse the chicken tenders and pat dry. Place in a large ziplock bag. Combine the rest of the ingredients in a high speed blender until smooth. Pour the marinade into the bag of chicken, seal and place in the refrigerator for 4 to 6 hours. Preheat oven to 375 degrees F. Place the marinated chicken in a baking pan and bake for 30 minutes. Remove from oven, drain off excess marinade, then place under high broil for 4 minutes, watching closely. Remove when golden. In a skillet over medium low heat, combine all of the ingredients and bring to a simmer. Simmer, stirring often, until the blackberries become bright and the sauce reaches desired consistency. If you wish to thicken the sauce more, add 1/2 teaspoon of arrowroot powder. Serve over the cooked chicken. If you don’t eat right, neither will your children. As much as you’d like to see the kids enthusiastically eating a pile of green veggies, you’ll need to be the first one to dig in. The easiest way to model healthy eating habits is to eat most of your meals at home. When you eat out, the kid’s menus options are mainly fried and carbohydrate-filled, and most come with a sugary beverage. When you make your own meals at home center the meal around a lean protein, such as chicken or fish, and then add in lots of colorful veggies. Start with the recipes in the blog. Wouldn’t it be great if your kids naturally enjoyed exercise? If this were the case then childhood obesity wouldn’t be the looming problem that it is. As adults we exercise to improve health, stay fit, and control weight. But what motivates a child to be physically active? Fun. Ultimately, if children and adults enjoy an activity, they’re more likely to stick with it. As you know, an inactive child has a greater chance of becoming an inactive adult if healthy habits aren’t instilled early in life. And it’s never too early to start. Just remember that exercising as a family won’t look like your typical workout. Here are some fun, creative ways to incorporate exercise into the life of your family. Let’s face it: chores and kids don’t mix. Not willingly at least. Chores and fun don’t usually mix, either. How can you combine chores with fitness while making it fun at the same time? Turn up your family’s favorite tunes and sing and dance while cleaning the house. Let the kids take turns choosing the music. All ages can be involved. The youngest can pick up toys or sweep the floors. The older kids can vacuum, dust, and help with laundry. Want a little more wiggle in your family exercise routine? Invite the kids’ friends over for a dance party. Move the furniture out of the way, turn down the lights, and turn up the tunes! Then get moving. If there’s snow on the ground, get out the sleds and head to a nearby hill. What about roller-skating as a family? Now there’s a fun family workout! Let each family member take turns choosing which activity to do on family nights, but keep the nights focused on fun fitness. And keep progress at the forefront with a chart on your refrigerator to track your family’s fitness goals. When fitness is incorporated into everyday life, it won’t become a drag or another thing to fit into your already busy schedule. Set aside just an hour two to three times a week to get moving as a family. Your kids will have fun and learn valuable life lessons. 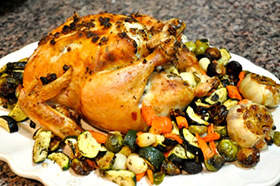 Roasting a whole chicken with veggies is a wonderful meal and is much simpler to prepare than you might think. Make this recipe on the weekend and then enjoy nutritious leftovers throughout your week. Cut off the tips of each section of the garlic bulbs. Place the blubs in a small glass pan. Brush the tops with the olive oil and sprinkle with salt and pepper. Cover the pan with aluminum foil and set aside. In a small bowl combine the melted coconut oil, fresh herbs, minced garlic, lemon zest and lemon juice. Set 1/3 of the mixture aside for the veggies. In a large bowl combine the carrots, zucchini, pearl onions and Brussels sprouts with 1/3 of the herb mixture. Season with salt and pepper. Set aside. Rinse your chicken and pat dry. 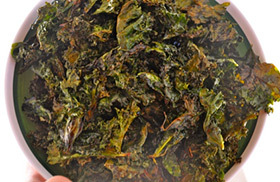 Carefully slide your hand between the skin and the breast and liberally rub some of the herb mixture. Rub the rest of the herb mixture over the top of the chicken. Season the chicken with salt and pepper and tie the legs together with kitchen string. Place the chicken on a large roasting pan, and surround it with the veggies. Roast the chicken and veggies for 30 minutes. Reduce the oven temperature to 350 degrees F, pour 1/2 cup of chicken broth over the chicken and veggies, and place the garlic pan in the oven off to the side. For the next 90 minutes, pour 1/2 cup of broth over the chicken and veggies every 30 minutes as it cooks at 350 degrees F.
To see if the chicken is done, poke the tip of a sharp knife between the leg and body and see that the juices run clear. Transfer the chicken and veggies to a large platter. Add a couple of the roasted garlic bulbs to the chicken platter, reserving one for the gravy. To make gravy: Pour all of the roasting pan juices into a skillet and bring to a simmer. Remove the garlic cloves from one of the roasted blubs and smash with a fork. Add garlic to skillet. Mix in the tablespoon of coconut flour, and whisk the gravy as it simmers. Cook for 10 minutes, or until desired thickness. Season with salt and pepper.